Book One is now out on Amazon! I just released my first ebook on Amazon. I have been talking about it forever without actually doing it, but now it is done. No take backs. I'm very nervous. I've put a lot of effort into making this ebook worth buying. I hired and worked with a professional editor, and I went through a rather long process where I tried to commission the perfect cover. Even discounting the countless hours spent writing and editing, getting all this done was very expensive, especially since I had no idea what I was doing. None of it would have been possible without my lovable patrons. I am super in debt to all of you. Thank you so much. If you enjoy my writing then please purchase this book. It helps me out way more than just putting a few bucks in my pocket. The more people buy the book on Amazon the more it will be advertised there. That means it will be easier for new people to find, and thus I will get more sales. A big boost from you guys will really help to get the sales ball rolling. Every purchase helps, like a lot. The other important thing to do is to review the book on Amazon. Every single good review helps promote my ebook there. Reviews by verified purchasers are especially important, so if you buy the book please take a minute to review it. I will be ever so grateful to you. It really means a lot. 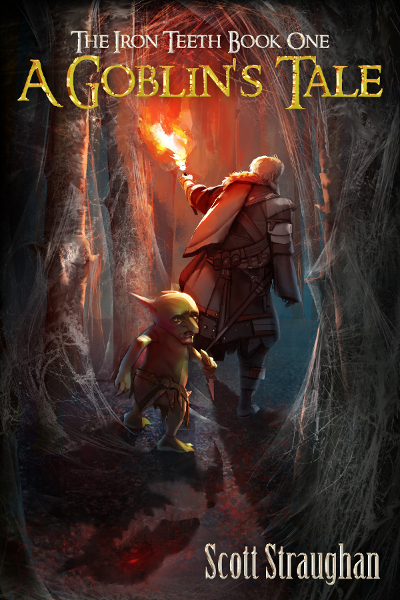 The Goblin's Tale chronicles the first book of the web serial. The story goes from the beginning of the serial to just before the characters set out for Daggerpoint. Some changes have been made to focus the plot and I have added some new scenes as well. Compared to the web serial the book is much more professional and streamlined. I think it is worth getting even if you have already read the web serial. It might just be time to reread the beginning of the story and remember all the things you missed. That sounds like fun to me. I chose the current price based on other novels. The Goblin's Tale is actually much longer than a lot of other books. It's over 120,000 words and its price reflects that. You can also review the book on Goodreads. I plan on releasing a physical book eventually, but I'm very busy right now, so I don't have a time frame. I'm super busy getting all the stuff for this book launch done, and to top it off I will be moving soon. Its a good thing I own next to nothing. Congrats! Really enjoying your story, I wish you large successes and at least another ten books for all of us to read! Congratulations for publishing your first book. Congrats. I must say i am new to RR and the few books i read before this were a disappointment to say the least. But this book blew al that away, I managed to read everything so far in 3 days and feel really happy about it. Great work! *Ps any chance for a version on paper? If there is i might wait with my purchase because i prefer that. Thanks for the awesome series! Congratualtions, I definitely think this book is worth the price. It has been one of my favorites to return to every single week. Just left a 5 star review for you here. congrats, I would have taken a physical copy right away. But I am not that sure about the kindle version. Congrats!!! The art looks amazing.